Jerry Lewis è morto a 91 anni, probabilmente per cause naturali, nella sua casa di Las Vegas, dove viveva con la seconda moglie, la ballerina Sandee Pitnick. Una ricchissima carriera, quella dell'amato Picchiatello, regista, attore, comico insuperabile. Born on March 16, 1926, in Newark, New Jersey, Jerry Lewis grew up performing in a vaudeville family. He met singer Dean Martin in 1945, and they developed a comedy act and performed in nightclubs like the Copacabana. As their popularity grew, the duo went from making $250 a week to $5,000, and Lewis never looked back. They made a successful transition into film with 1949's My Friend Irma, which would lead to a string of roles in popular films and TV appearances. After the comedy duo split, Martin continued to make movies including The Delicate Delinquent (1957), The Bellboy (1960) and The Nutty Professor (1963). In addition to his prolific career as an entertainer, Lewis was active in the fight against muscular dystrophy, hosting the annual telethon for the Muscular Dystrophy Association from 1966 to 2010. 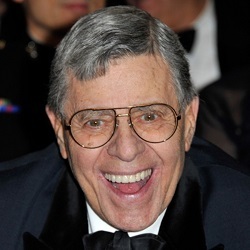 Comedian, actor and director Jerry Lewis was born Joseph Levitch on March 16, 1926, in Newark, New Jersey. His father, Daniel Levitch, who went by the stage name Danny Lewis, was an actor, master of ceremonies and all-around performer. His mother, Rae Lewis, played piano for the New York City radio station WOR and was her husband's musical director. Growing up in a show-business family, Lewis began following in his parents' footsteps, making his debut at the age of 5, singing "Brother, Can You Spare a Dime?" at "Borscht Belt" nightclubs in the Catskill Mountains in New York. A decade later, at the age of 15, Jerry Lewis dropped out of high school to pursue a full-time career as a performer. He devised a comedy routine known as the "Record Act" in which he mimed and mouthed the lyrics to operatic and popular songs while a phonograph played the songs offstage. He took his act to the offices of several booking agents before finally landing a gig at a burlesque house in Buffalo. His debut performance fell flat, though, and unable to book any shows at more prestigious venues, Lewis worked as a theater usher and soda jerk to make ends meet. He grew depressed and was on the verge of giving up on his show-business dreams when a friend of his father's, the comedian Max Coleman, convinced him to give comedy another shot and helped him land a performance at Brown's Hotel in Loch Sheldrake, New York. This time his comedy routine received thunderous applause, and among the enthusiastic audience members was another comedian, Irving Kaye, who helped the young Lewis book book more Borscht Belt appearances. In 1945, a 19-year-old Lewis met a young crooner named Dean Martin while performing at the Glass Hat Club in New York City. A year later, when Lewis was performing at the 500 Club in Atlantic City and another performer suddenly quit, Lewis suggested that the club book Dean Martin as a replacement. On July 25, 1946, Martin joined Lewis as a performer at the 500 Club, and one of the greatest partnerships in the history of American show business was born.Their act began with Martin singing a song only to be interrupted by Lewis, with the routine soon devolving into a hilarious improvised sequence that included ad-libbed insults, food fights and frequent banter with the audience. Billed as Martin and Lewis, the duo became such an instantaneous success that in a matter of months they went from earning $250 a week to earning $5,000. In 1949, the pair landed their own regular radio comedy show, The Martin and Lewis Show, and after Paramount producer Hal Wallis saw them perform at the Copacabana nightclub in New York, he signed them both to a film contract. Martin and Lewis made their big-screen debut in the 1949 film My Friend Irma, earning rave reviews. The New York Times wrote, "We could go along with the laughs which were fetched by a new mad comedian, Jerry Lewis by name. This freakishly built and acting young man, who has been seen in nightclubs hereabouts with a collar-ad partner, Dean Martin, has a genuine comic quality. The swift eccentricity of his movements, the harrowing features of his face, and the squeak of his vocal protestations...have flair. His idiocy constitutes the burlesque of an idiot, which is something else again. He's the funniest thing in the picture." Over the next decade, Dean Martin and Jerry Lewis made 16 films together, including My Friend Irma Goes West (1950), The Stooge (1952) and Hollywood or Bust (1956). The pair also made frequent television appearances on The Ed Sullivan Show and The Colgate Comedy Hour. However, by the mid-1950s their partnership and friendship began to fray as Lewis received greater national attention and, as he admitted later, drove Martin away with his egotism and insensitivity. The two split ways, both professionally and personally, in 1956. After his split with Dean Martin, Jerry Lewis went on to a successful solo career as both an actor and director. His first film without Martin, The Delicate Delinquent (1957), was a huge hit and immediately established Lewis as a star in his own right. In 1959, Lewis signed a new contract with Paramount that paid him $10 million up front and 60 percent of box office profits, the most lucrative contract ever signed by a film star at that time. The contract also provided Lewis with greater control over his films, and he made his directorial debut with the 1960 comedy The Bellboy. He went on to direct and star in a number of highly successful films, such as The Nutty Professor (1963), Three on a Couch (1966) and The Day the Clown Cried (1972). As an actor, he also turned in an acclaimed performance in the 1982 Martin Scorsese film The King of Comedy and fulfilled his lifelong dream of acting on Broadway as the star of the 1995 production of Damn Yankees. Based on his extensive experience as an actor, director and producer, in 1967 Lewis began teaching graduate film courses at the University of Southern California. His lectures have been collected into a book, The Total Film-Maker (1971), which is considered a seminal text on filmmaking. Lewis also has a dedicated fan following in Europe, and especially in France, where he won Best Director of the Year three times. When his film Hardly Working opened in Paris, the marquee of a cinema on the Champs Elysees read simply, "JERRY." In addition to his prolific career as an entertainer, Lewis has been active in the fight against muscular dystrophy. Until 2011, he served as the chairman of the Muscular Dystrophy Association and hosted an annual telethon that has raised nearly $60 million a year in donations (adding up to $2.6 billion during a nearly half-century run). For his efforts, Lewis was nominated for the Nobel Peace Prize in 1977 and received the Jean Hersholt Humanitarian Award at the 2009 Oscars ceremony. Lewis married Patti Palmer in 1944, and they had six sons together before eventually divorcing in 1980. In 1983, Lewis married SanDee Pitnick, and they adopted a daughter together. In 2009, tragedy struck when Lewis' son Joseph, the youngest of six children from his first marriage who struggled with drug addiction, committed suicide at age 45. While the two hadn't been close for the previous 20 years, Lewis opened up about his son's untimely death in 2014, saying, "He was my son and he's gone, and there's not a lot I can do about that. I beat myself a thousand times . . .You don't get over that." Also in 2009, Suzan Lewis, a woman claiming to be Lewis's daughter, came forward with DNA proof that her claims were true. Lewis has since gone on to write an autobiography called Jerry Lewis, My Father, Is Always in My Mirror. Gary Lewis, Jerry Lewis' oldest son, also pursued a show business career as the frontman for the band Gary Lewis and the Playboys. The band had a string of top-ten hits in the mid-1960s. In March 2014, Lewis took to the stage once again, selling out his one-man show at the 2,400-seat La Mirada Theatre for the Performing Arts in La Mirada, California. A month later, his hand- and footprints were placed into the cement outside Hollywood's TCL Chinese Theatre, a long overdue honor. In both his passionate comedic performances and his tireless charitable fundraising, Jerry Lewis displayed an insatiable appetite for life. He expressed this boundless joy of living in his own personal motto, borrowed from the Quaker missionary Stephen Grellet: "I shall pass through this world but once. Any good, therefore, that I can do or any kindness that I can show to any human being, let me do it now. Let me not defer nor neglect it, for I shall not pass this way again!"